← Want to be water cannoned? There have been very few (actually zero) posts here for the last few months. This is due to a very good excuse. Actually two very good excuses. It’s amazing how little time there is to diddle around on the internet when there you are lucky enough to have two tiny babies look after. I’m also starting to realise that everything I thought about the area before having children has now changed. It’s like entering a bizarre parallel universe. In BabyWorld, Cook went from being an “unnecessary posh Iceland that replaced Sisters & Daughters”, to being my only route to a decent evening meal during the early days of twin care. Blackheath switched from being the anonymous place where nobody talks to each other, to a thriving local community where everybody knows what everybody else is up to. It’s amazing what an icebreaker pushing a double buggy is. I might start hiring them out. And this DIY shop becomes the only place that will fix your broken buggy (for free, I might add) on a wet Sunday afternoon. And there’s so much more I should be asking you. Are we going to end up with a crappy Asda opposite our crappy Sainsbury’s? (Heidi wrote a hedging post about this. Let’s not forget New Labour practically invented cheap housing over massive supermarkets). What about the new bakers? Will I be able to look at that weird apostrophe every morning? What do they think of the Chorleywood Bread Process? Will Boulangerie Jade survive? Or will the curse of India Jane be too much to shake off? Anyway, that’s all for now. I should probably be changing a nappy. Thanks! I’ll try and make them a more frequent occurrence! Wow. Congratulations and welcome back. Keep it up!! Congratulations on the babies! How very exciting! The very best to you all over Christmas and into the New Year. Bravo! Nice to see you back! I kno nuffink of Cook (can it be as good as Hand Made Food?) and believe Asda to be the work of the devil (see any article about the iniquities of Walmart), but Gail’s bakery makes serious sourdough and French pain de campagne that knocks Jade into a cocked hat. I can’t wait! Above all….congratulations ! Everything else pales towards insignificance, hope to see you around. Welcome back and congratulations on your twins. Enjoyed your post. The Chorleywood thing was one of the biggest disasters to hit the UK – revolting, additive enriched bread for the masses – please everyone a) start baking and b) join the Real Bread Campaign. All those sliced loaves on the supermarket shelves – full of seeds etc even the organic ones – are all full of additives. Oh dear. Fancy providing for “the masses”. How despicable to enable my mum to buy bread more than twice a week all those decades ago [and not worry about it going mouldy in our damp house]. And how deplorable that I – like most of my friends – love the taste and texture of white sliced [try offering them bacon sarnie made with artisan wholemeal]. I could, of course spend my rare spare time kneading dough to produce a heavyweight, brown brick. I could also do all my own plumbing, electrical work, roofing, etc. But, again, I have to work long hours to make a living. Welcome back! Yes having children changes everything. So good to have you back and congratulations. You must be knackered! As much as I hate the idea of an Asda (oh for a Waitrose! :) at least that God forsaken hole Leegate will get a makeover. Granted it will have one average supermarket and probably not much else, but that is an improvement. Woooo he’s back! Hooray for Mr and Mrs B and the new little bugelings (buglings?). Blackheath is a great friendly place to bring up a family as we have found over the years. 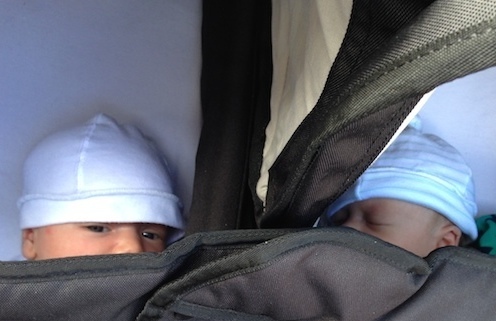 Any blog postings welcome if you can find time amidst the happy chaos of babies. Many congratulations to you both. Now all you have to learn is Village Pavement Etiquette. Wandering the open spaces from O’Neill’s to Heath Bookshop: OK. Stopping/dawdling for a window gaze or chat between 27/7 and the station deli: expect expletives! Good to have you back in the blogosphere – and congratulations! Oh congratulations! As someone who had his daughter in Blackheath, I can completely empathise. Good to have the blog back! Best of luck with the twins. Congratulations! Double trouble :-) It’s great to see you posting again.